The UN Secretary-General Ban Ki-moon condemned the airstrike on the funeral ceremony held in the Yemeni city of Sana’a carried out by the Saudi Arabia-led coalition, his Spokesman said in a statement. “The Secretary-General condemns the attack on an event hall in Sana’a where hundreds of people were gathered for a funeral ceremony,” the statement read. “Initial reports indicate that the attack, said to have been airstrikes by the Coalition, killed over 140 people and injured hundreds of others… The Secretary-General notes that any deliberate attack against civilians is utterly unacceptable and calls for a prompt and impartial investigation of this incident. Those responsible for the attack must be brought to justice,” it added, as reported by Tasnim. According to the UN estimates, the attack claimed over 140 lives and left more than 534 people wounded. “This violence against civilians in Yemen must stop immediately,” he added, as reported by Yemeni sources. UN relief chief Stephen O’Brien also demanded a prompt and “impartial” probe into the incident, saying, “This horrendous and heinous attack displayed an utter disregard for human life. Riyadh’s key ally Washington warned it had launched an “immediate review” of support to the Arab coalition. “We are deeply disturbed by reports of today’s air strike on a funeral hall in Yemen, which, if confirmed, would continue the troubling series of attacks striking Yemeni civilians,” White House National Security Council spokesman Ned Price said in a statement. Price stressed that “US security cooperation with Saudi Arabia is not a blank cheque”, and called on all sides to implement an “immediate” ceasefire, AFP reported. Yemen has been engulfed in a military conflict between forces allied with fugitive former Yemeni President Abd Rabbuh Mansour Hadi and Houthis since 2014. 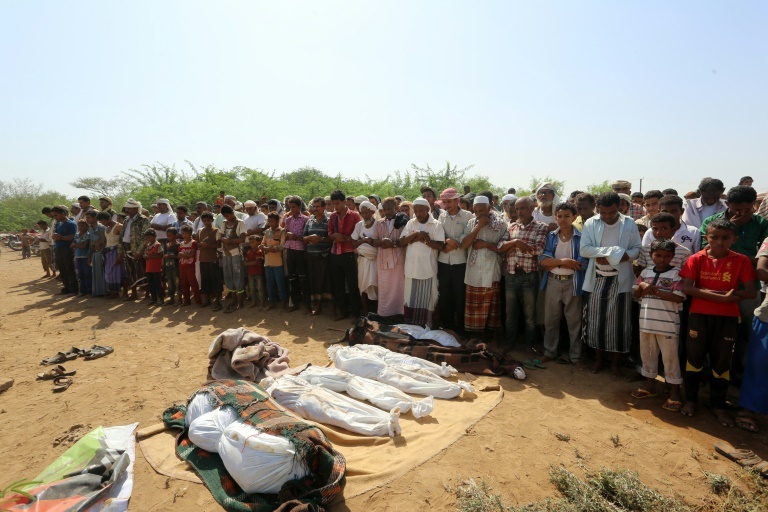 Since March 2015, the Saudi-led coalition of mostly Persian Gulf countries has been carrying out airstrikes against the Houthis at the request of Hadi.